So, as I neared my goal weight, my pedometer ran out of batteries. I had been eyeing a wearable fitness tracker and decided this was a good excuse to buy one. Yeah... $5 for a new battery or $100 for a new tracker? I’m not sure how I let myself trick me into thinking that was logical. Up till now, I have been using the Ozeri 4x3motion Digital Pedometer (affiliate link) that I picked up from Amazon for under $25. My doctor had recommended a pedometer when I told her that my primary mode of exercise is through walking. It worked pretty good. Whenever I watched it, it seemed to accurately keep track of steps. It has three axis instead of two, which is really important if you are looking for a cheap tracker. With only two axis, a pedometer needs to be positioned correctly in order to accurately keep track of steps. Those with three axis can be in any position. I could wear mine around my neck while jog/walking then throw it into my purse for the rest of the day. This way it keeps track of all my walking while outside of the building. I probably should have worn it all the time to get a better understanding of Calories burned throughout the day, but it wasn't convenient to wear. At first I would keep it in my pocket, but not all of my work clothes have pockets. I also didn't realize that I should be tracking every step, so that I could calculate my total Calorie burn correctly. It’s a good tracker if you are looking for something cheap or are just starting out and are not sure if this is going to stick. I decided to graduate from this tracker to a wearable tracker. There are a few of them out there. I chose the FitBit Flex (link to official site). Here is a quick and dirty list of pros and cons for this tracker that I came up with. I was doing the whole fitness tracker wrong. With my $25 tracker, I only wore it while exercising to gauge how many Calories I burned during this session. I would then report this to MyFitnessPal. With the FitBit, I wear it 100% of the time. Well… I do take it off for showers, but technically you could even wear it then. It calculates your total Calorie burn for the whole day, then reports a Calorie adjustment to MyFitnessPal. MyFitnessPal could only guess how much I burn each day based on whether I report a sedate lifestyle (sitting at a desk all day), but didn't really know if this was accurate. What I found was that on the weekdays I actually have been burning more Calories than originally calculated. On the flip side, I am actually burning less Calories than originally calculated. With the FitBit, I get a better picture of how active I am throughout the day. 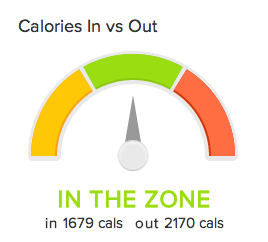 Even if I exercise, I might not be meeting my Calorie balance goal. I love that it syncs so smoothly with MFP. I’ll log my food with MFP, then switch to the Fitbit dashboard, hit refresh and it is all updated! It really is very smooth. When you set up FitBit, there is a step where you can connect it to MFP. With a click of a button, everything gets synced between the two systems. FitBit will pull all of your food information from MFP and MFP will pull your total Calorie burn from FitBit. Understanding this relationship between the two apps is important. You will want to log all of your food with MFP. If you log food in FitBit, MFP will not reflect this. The same is true with exercise. If you log exercise with MFP, it will not be accurate with FitBit. So just remember that MFP is for logging food and FitBit is for logging exercise. Any exercise you do on top of what the FitBit can calculate (like an exercise machine, for instance), needs to be logged separately with FitBit. progress in meeting your goal. I thought I would like the dot LED system with FitBit Flex, but after not even a full day I thoroughly missed having a step count. I especially missed it while doing a jog/walk. If it syncs with your phone, you could get your step count from there. I don't typically take my phone with me jog/walking, so this feature isn't suited well to me. The display on the FitBit Flex shows 5 dots. As you start off your day, only 1 dot is lit up. As you approach your goal, the dots light up. Once you hit your goal, 5 dots will be displayed and the FitBit will vibrate to celebrate hitting your goal. It is a nice idea, but having a numerical number is much easier to gauge what I need to do in order to get to my goal. With dots, I don't have a full understanding if I need to keep jog/walking for 10 minutes or 40 minutes. This obviously is a common complaint with the FitBit Flex, because its successor, the FitBit Force, displays steps, Calories and stairs. Check whether your phone is on the compatible list. I thought since I have the latest and greatest Nexus device I should be good. I was wrong. Apparently there is a bug with Bluetooth syncing that will drain the FitBit battery. I have signed up for a beta invite to beta test Bluetooth syncing for Nexus 4. We'll see if I get accepted. They are planning on adding support to more devices. I'll be happy once they do. I’d like to be able to check my steps while on the go. This is especially more important since there is no display on the device itself. The FitBit Flex comes with a USB dongle that you plug into your computer. Once you are in range with your computer, it wireless syncs in the background. You can also force a sync at any time. Since only my home computer syncs with my FitBit, I have found that I don't even think about my steps all day until I get home. Then I jump on my computer, it syncs, and I take a look at it. This might be your preference, but for me I want to have more feedback throughout the day. I want to know if I should go for a walk at lunch. Or be prepared to go for a walk when I get home from work. I've thought about purchasing another dongle for my work computer. They are $20 and could be worth it. For now, my current system works. All of the other FitBits count stairs except for the FitBit Flex. If you get the Force, it counts stairs and will display the count. My main method of exercise is walking, jog/walking and climbing stairs. I didn't have a device to count stairs before, so I don’t miss it now. However, this would be a nice feature. 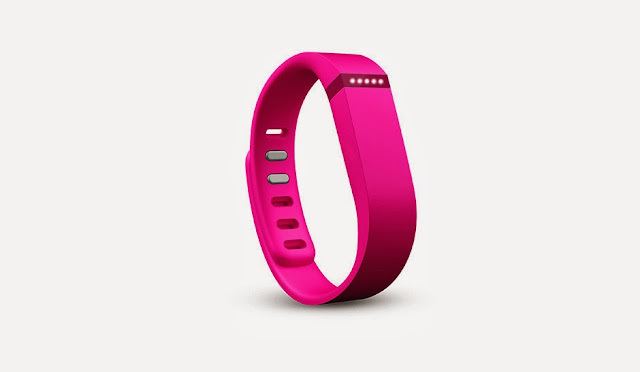 The FitBit Flex is worn on your wrist. Most trackers are typically tucked away where it is concealed. 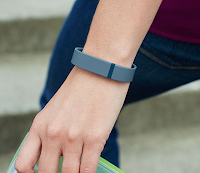 The FitBit Flex is worn on your wrist. This makes it very visible, especially if you opt for a bright and cheery color. I rather like how it looks, but it certainly isn’t a look for everyone. I know many others prefer the other FitBits because you can clip them somewhere conspicuous. I did have a co-worker ask me, “what is that?” Which I then explained that it is a glorified pedometer. She laughed. Like I said though, I kind of like how it looks. It reminds me of those trendy rubber bracelets that everyone was wearing for a while there. 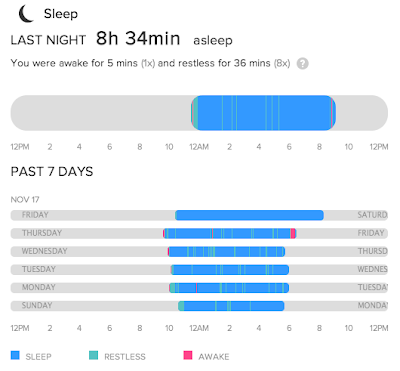 The FitBit tracks time that you were asleep, restless or awake. It is an interesting feature, although I am not really sure what to do with the data. I have insomnia sometimes and I sometimes wake multiple times through the night. So now I know exactly what time I have moments of restlessness or I am awake. So now what? How do I work towards a better rest? I've heard the Jawbone Up gives advice. The FitBit is silent. It tracks the data, but doesn't give me advice on what to do with it. 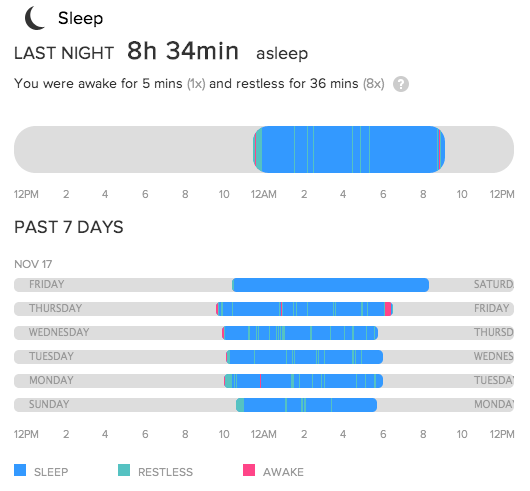 Sleep Journal on the FitBit Dashboard. 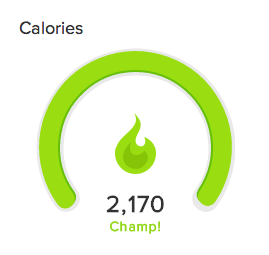 This is perhaps my favorite feature of the FitBit Flex. It may sound strange, but it is an oddly soothing way to wake up. Instead of a loud, obnoxious alarm clock, I am woken up with a gentle, pulsating vibration. It is easy to set multiple alarms throughout the week. They can be set up to repeat or be a one time event. Alarms can be set through the computer dashboard or your phone app. Silent alarm gently vibrates to wake you. The FitBit Flex costs $100. I recommend picking it up from the Amazon store if you want a fun color. I picked mine up at my local Target for the same price, but they only carried the black and slate blue color. If all you are looking for is a pedometer, a $25 pedometer (affiliate link) may work just as well. I think most of these wearable trackers are a bit over priced and over glorified. Even still, I do like many of the features of the FitBit Flex. I like the wireless sync to the computer, effortless syncing with MFP and the vibrate to wake function. And, like I said before, I kind of like how it looks. 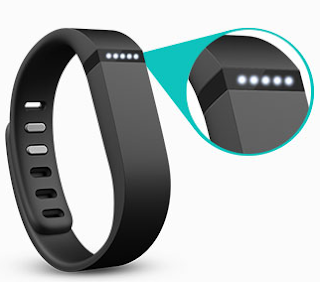 My recommendation if you are considering the FitBit Flex is to also consider going up $20 and get the FitBit Force. It wipes out my #1 complaint by giving you a display that shows steps, Calories burned, stairs and even the time. I would totally upgrade, but I JUST bought the FitBit Flex. I purchased it seriously 1 week before the Force was announced. My fiancé told me to return it, but I decided not to. One benefit of the Flex over the Force is that you can swap out the band whenever you get bored of the color. The band does also get scuffed and worn over time, so being able to swap them out is actually kind of nice. You can also switch between the large and small band. I am currently between band sizes and expect to go down from the large to the small soon. 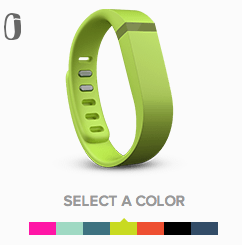 I really want to pick up the lime green band and the pink band. When I first purchased mine, neither of these colors were available. I love that more colors are being offered! Do you use a fitness tracker? If so, which one do you use and would you recommend it? P.S. I met my 25 pounds lost goal! My BMI is now in the healthy category. Yay! I am planning on going down 5 or 10 more pounds so that I have room to go up without tipping back into the overweight category. I will continue to track my Calories with MFP and FitBit to ensure that I don't relapse and start gaining weight again. I have heard that if you can keep the weight off for 5 years that you are then likely to succeed in keeping the weight off permanently. I am sure that having kids will help knock me back into needing to lose weight. We'll see! You KNOW I'm a huge Fitbit fan (as I've done several posts about it on my blog and show my Fitbit stats for my daily/monthly stats). My 18 year old son has the Flex. I have the One, for some of the reasons you mentioned (I like it to be inconspicuous, like to see my stats, like the stairs function). So sorry your phone doesn't work with the app. I AM home most of the time, but I still find the syncing to the app function so helpful. I adore the visual representation of the day in graph form. That I can SEE my exercise spikes, or even the walk to/from the parking lot of some places. I started with a $25 Omron, and actually I do still wear it too (but I do wear it all the time, except for sleeping). I find it interesting to see how close my daily numbers are, and to compare the Omron's "aerobic" minutes to Fitbit's "very active" minutes. Hope you continue to enjoy your Fitbit. I do think the Force is an improvement, but my son doesn't really care about the additional features, he's happy with the Flex. But for most people I would echo your recommendation to go for the Force, or the One. Thank you for sharing! You should come link up with us for Tips and Tricks Tuesday! I know a lot of people would love to see this! Fantastic review! I got the Fitbit Zip a while ago and I have major mixed feelings about it! I love the info, love syncing to MFP, and love the display. I hate that I forget it ALL THE TIME! I never seem to wear it when I actually am really active. I need something I can wear on my wrist and, for the reasons you described I think I would need the Force. Thanks so much for the great review and linking up with us! Congrats on reaching your goal, friend! That is awesome! And how cool is this thing!? I might have to put that on the "suggestion" list for hubby to peruse. ;) Hope you are doing well and having a great week!! I'm seriously thinking of purchasing one of the fitbit "Flex". The force is really cool too but its not as thin and feminine. There has also been a recall on the "force". Something about the nickel in it breaking out peoples arms. But I'm sure that's been resolved by now. Thanks for sharing your input on these. Now all I need to do is decide on a color!!! !